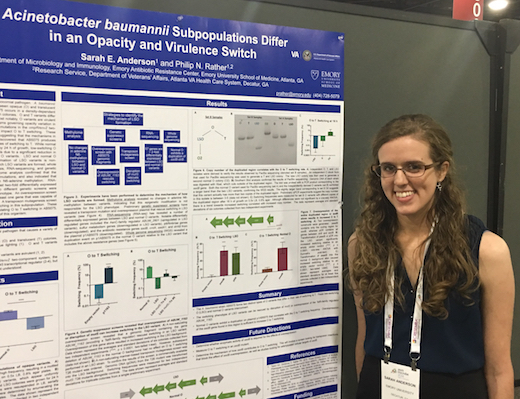 Rather’s lab recently published a Nature Microbiology paper on A. baumannii’s virulence/opacity switch. This type of bacteria is known for hospital-associated infections and for wound infections in military personnel. Poster talk by graduate student Sarah Anderson June 8. Members of her team are giving presentations on the hardy gastrointestinal scourge. Working with chemists from Wisconsin, McBride’s lab showed in 2014 that nylon copolymers can inhibit the growth of “C diff”, mimicking the action of a host defense peptide. Quave, known for her work on antimicrobial substances in plant extracts, is holding a “Fireside Chat” event on June 10. We’ve recently highlighted Wright’s cryo-electron tomography work on viruses, but the technique is applicable to bacteria as well. Plenary session. Prosthetic joint infections and detection of resistance to the last-resort antibiotic colistin.